Day 1: The tour starts at 09:00 by car from Rurrenabaque to Santa Rosa del Yacuma (which is 100 Km far from Rurrenabaque). Herons, sloths, and other different fauna and flora species can be seen during this period of time in the hummid pampas of the Bolivian Amazon. Close to the middle day, the group has lunch in Santa Rosa. Then, we continue the trip by boat about 3 ½ hours in the Yacuma River (this river is 15 minutes far from the Santa Rosa town). Reptiles and amphibians such as turtles, alligators, frogs and lizards are resting on the River Yacuma bank. Some mammals like the night monkey, howler monkey, spider monkey and capybaras can also be observed. Besides, there are birds like hawks, hoatzin, jabiru, red and blue macaws, toucans. And other animal species like marsh deer and eagles can be appreciated. The trip by boat ends in our ecolodge at dusk.Once we arrive to the ecolodge, delicious coffe, milk, herbal tea and beberages are available in our dinning room. After, we move to a place where you will enjoy the an amazing colorful sunset in the Bolivian Amazon. Back to the ecolodge, the buffet dinner is ready. Typical dinners include rice, lentils, pasta, salads, fresh vegetables, and bread. 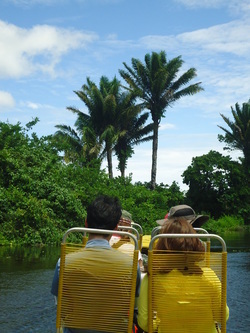 After dinner, the group visits the river Yacuma by boat. The group will be looking for alligators to look at their shinning eyes at night (you do need your flashlight). Also, it can be appreciated some other nocturnal animals. Day 2: We share a buffet breakfast at 07:00 . Then, we depart in a trip on the Yacuna River to head out for a fishing trip (Alternative activity according to season: Swimming with Pink Dolphins). The catch: piranhas. These predatory fish are abundant in the region and have been a dietary staple of indigenous communities for generations. Our guides know the best spots to find piranhas and teach you traditional methods of catching them using raw beef for bait. Most of them are given back to the river as we protect the nature. Later, we look for eagles, toucans, sloths. We observe the lush tropical vegetation (flowers and plants) such as orchids (like the one called “Reina Victoria”), bibosi and more. Later, we go to a fishing trip. After this experience, we head the lodge to have lunch. Then, we come back to Santa Rosa by boat . After 1 ½, we arrive to Santa Rosa to take the car to Rurrenabaque. We arrive into Rurrenabaque around 17:00.